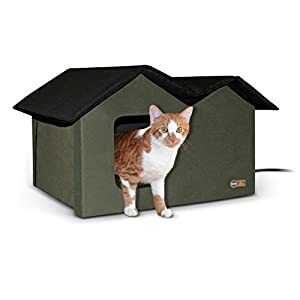 Best Outdoor Cat House Review: Top On The Market in 2019! Whether it’s for feral cats or just for your pet’s playtime, outdoor cat houses perform two important functions. 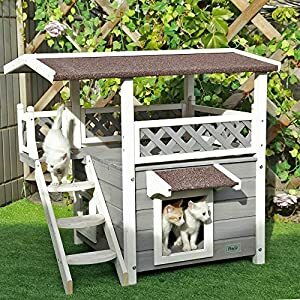 They provide shelter and heat as well as a comfortable playground for cats outdoors. Some cat houses are only designed for shelter, and some provide heat from a power source, others are designed for play and comfort, as well as shelter from the elements. Materials can vary, from wood to composite fabrics, and plastics. There isn’t much of science in deciding which one you need, it’s all down to location, do you live in a cold or hot environment, is it dry or rainy? You choose your car shelter from to suit the environment; then you add the other options of choice to suit your personal needs. Environment: Rainy, Hot, Cold, Dry, Humid? Match the material to the environment, don’t take wood to a humid place, it expands and contracts, while plastics overheat in hot climates. Make sure its waterproof in rainy weather and warm enough in cold climates. Safety: Make sure the coatings are all non-poisonous. Durable: Check to see that they will withstand active pets that like to chew, gnaw and scratch surfaces. Reliable: Make sure the construction is solid and if you assemble it, that all the joints are a tight fit. Space: Make sure your house is big enough for your pet, and if you have more than one pet, think about a larger house. Comfort: Consider adding a heating unit, or mat if the unit is bare. 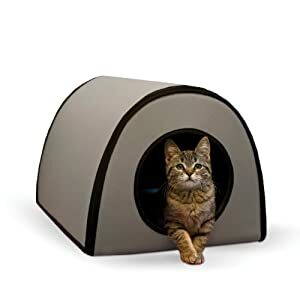 The Kitty Tube Gen 3 outdoor cat house design is made of a durable and solid recycled PVC material. The shape and design were developed for minimum scratch damage and maximum warmth through reflective heating. The interior is covered with a moisture resistant Scratch Guard™ coating that rejects mold, mildew, bacteria, and cat urine. There are awnings covering the ventilation holes, so they can remain open even when it is raining or snowing. This is a one-piece product that comes with a removable lid. The lid seam is secured and provides a water-free environment even in the heaviest of storms. It is easy to clean, just spray it with water and wipe. The insulation is designed for extra warmth during the winter season and cool in the summer. The door is designed for cats, which prevents predators such as dogs and coyotes to take advantage. 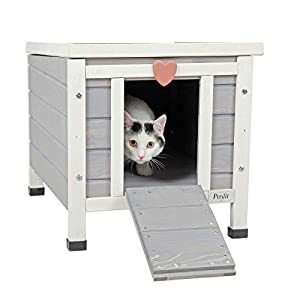 Bottom Line: This is a medium-priced cat house, it’s a great all weather solution, but is not as “pretty” as other designs. If you are seeking functionality, you have it; this is a functional and durable cat house. Good value for money. K&H is a famous brand that provides quality at an affordable price. Basically, this is the company to buy from if you are unsure. K&H is what we call a “safe bet,” you will always be pleased with what you buy. This is their Outdoor Kitty House comes in a Heated or Unheated model. To start off with, this is a 600-denier nylon house with a vinyl backing, so its easy to clean and sturdy enough to withstand scratches. The heated version integrates the K&H Lectro-Soft Outdoor Heated Bed. Both versions have the same dimensions and come with a roof that covers the 2 doors with ample overhang. 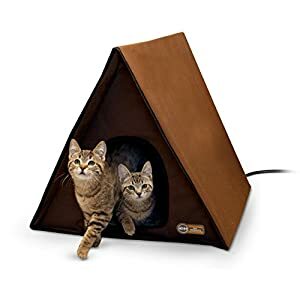 This waterproof cathouse is rainproof and comfortably dry. The two doors make this model predator safe for your cat, allowing them the chance to escape from one of two directions. All K&H cat houses come with hook & loop fasteners for easy assembly. The heating element is powered by a 25 watts power source. The heated floor pad covers half the floor, so your cat can decide which position it prefers, on the heat or off it. 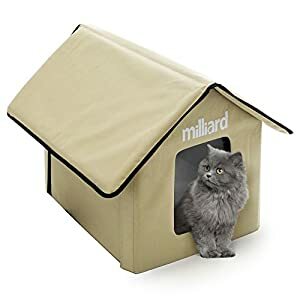 The overall dimensions of this model are 14″ W x 18″ D x 16″ H.
Bottom Line: This is a versatile and really budget friendly heated or unheated cat house. One thing for sure, your cat will never be worried about the winter cold with this model. This is one fancy pet house that can come with you when you go camping or traveling, providing your pet with that extra comfort that comes from familiarity. This model is made from 600-denier nylon canvas and provides total waterproofing as well as durability against scratching. The door flaps are made of transparent plastic, so your pet can stay warm from reflective interior heating while being able to keep an eye on what’s going on outside. Bottom Line: This is such a budget-friendly option that you need to have one even if you already own a pet house. This is your mobile version, keep it in the car at all times, and pack it when traveling abroad too. If it’s a classic wood shelter you want for your pet, then you will love this weather resistant “Scandinavian” designed outdoor pet house. This model comes with 12mm thick wood panels and when assembled will provide a great waterproof environment, warm and comfortable, the way only wood can provide. Since it is wood, there is one consideration you must factor into your decision before buying it. Is your pet destructive? If so, it will chew and scratch the wood to the extent that the wood will eventually be exposed to the elements and rot away. This has been tested, and all wood houses last no more than 3 years when providing shade and warmth to the more destructive pets. When you buy a wood model, you need to buy a blanket, pillow or cushion for the floor. This will provide extra comfort to your pet on all days, and if you place a reflective heating mat on the floor, it will provide perfect comfort on the cold and wet days. Take into account that the paint is a waterproof base, so when scratched off, the wood will be open to the elements. Having stated this, wood houses are much more budget-friendly, sturdier and prettier than their synthetic counterparts. Wood is also much more insulative and natural and is really an environmentally friendly material. 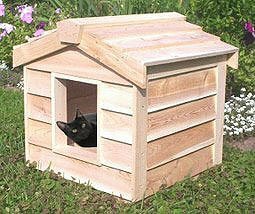 This is a cedar wood pet shelter for easy access to both cat and owner. This inner dimension is 16″ x 20″ x 17,” and the top opens up on hinges, allowing you the ability to pick up a stubborn pet. This model is set on raised legs, so that the floor comes with small breathing holes, allowing air to circulate from under the house. The paint is water based and will not cause your cat any issues when it decides to chew or scratch the wood. This model comes with an asphalt roof, so its totally waterproof and you can remove the floor for easy cleaning. Bottom Line: This is a very functional pet house option, and I find its hinged roof the masterpiece. After all, how many times have struggled with a stubborn pet that doesn’t want to come out. If it’s all about pose and style, you don’t get much more from any model than the Petsfit 2 story house. This house is made of sturdy cedar wood and comes with two stories. The design includes some nifty paintwork, a small ramp, and cute windows. This model comes with 12mm thick wood panels and when assembled will provide a great waterproof environment, warm and comfortable, the way only wood can provide. Since it is wood, there is one consideration you must factor into your decision before buying it. Is your pet destructive? If so, it will chew and scratch the wood to the extent that the wood will eventually be exposed to the elements and rot away. This has been tested, and all wood houses last no more than 3 years when providing shade and warmth to the more destructive pets. When you buy a wood model, you need to buy blankets, pillows or cushions for the floors. This will provide extra comfort to your pet on all days, and if you place a reflective heating mat on the floor, it will provide perfect comfort on the cold and wet days. Bottom Line: This is exceptional value for money, I mean it. I bought one and haven’t been happier. Yes, one of my little angels is really a Tasmanian devil in disguise, aptly renamed “Taz,” she goes through the wood like she eats fish. However, this home keeps them busy, and they even love using it in the winter, although in winter they obviously prefer the ground floor to the opened top. When it comes to Scandinavia and Ikea type furniture, this one hits the nail on the head. It’s a no-nonsense treated cedar wood with a Thermal-Ply insulation inner layer that provides heat. So you get both weather resistance and heating in one simple design. Its height, standing on four legs helps against predators, and also gives your pet that extra patio style lounging environment. These are handmade, so you get solid, sturdy designs tested and proven. The interior size is 14” x 13,” and the deck size is 9” x 17”. You can also add vinyl flaps for the two doors, which also helps protect your pet from predators, but the vinyl doors have to be ordered separately. Bottom Line: This is a Canadian product, handmade and with a price tag that shows this. Each one is crafted with love and care, so you pay for quality. It’s time to present another fine K&H product. This time K&H has provided an interesting concept, it’s a birch wood cat house that comes with treated but unpainted wood. You get to paint it decorate its exterior any way you like. This model is heated, you get a 25 watt MET safety listed heated pad, so your pet gets to enjoy some pleasant warmth in the colder months. This house’s interior dimensions are 13″ x 15,” and the value for money is evident in the solid construction and wonderful heating element provided. Bottom Line: I bought one of these for my daughter, only because I wanted her to have the fun of decorating the outside, guess what, it worked. 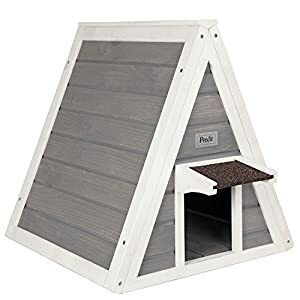 Its time for another K&H Outdoor Kitty House and this one is their triangular (A-Frame) unit. Now I actually like this one a lot; it’s so simple it makes you cry with frustration, why didn’t I have this before. To start off with, this is a 600-denier nylon house with a vinyl backing, so its easy to clean and sturdy enough to withstand scratches. The heated version integrates the K&H Lectro-Soft Outdoor Heated Bed. Both versions have the same dimensions and come with a roof that covers the 2 doors with ample overhang. 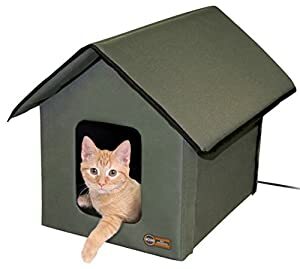 This waterproof cathouse is rainproof and comfortably dry. The two doors make this model predator safe for your cat, allowing them the chance to escape from one of two directions. All K&H cat houses come with hook & loop fasteners for easy assembly. The heating element is powered by a 40 watts power source. 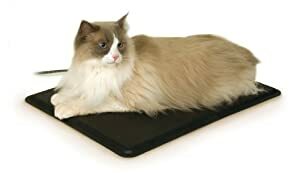 The heated floor pad covers half the floor, so your cat can decide which position it prefers, on the heat or off it. The inner dimensions of this model are 19″ W x 24″ D x 18″ H.
Bottom Line: I was looking for a real space conscious and easy to set up pet house for one of my more particular cats. This was the best solution, and it’s a treat. Its true value for money and they looked like little British Queens guard’s huts when all lined up in a row. Yes, you got it, you didn’t even need to guess, this is yet another great K&H model, this time it’s their modern house design, and it works a treat as well as looks great. If you are interested in modern designs, then this model will suit your needs. This model has a rigid 600-denier nylon house with a vinyl backing, so it’s easy to clean and sturdy enough to withstand scratches. The heated version integrates the K&H Lectro-Soft Outdoor Heated Bed. Both versions have the same dimensions and come with a roof that covers the 2 doors with ample overhang. This waterproof cathouse is rainproof and comfortably dry. 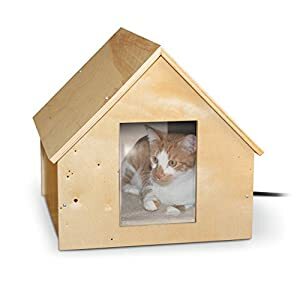 The two doors make this model predator safe for your cat, allowing them the chance to escape from one of two directions. 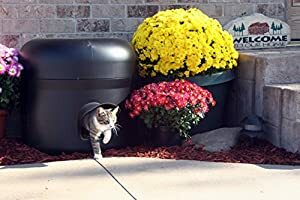 Bottom Line: This sleek looking cat house is actually quite nifty, and its round design makes it easy to conceal in many areas. It is also great value for money. OK, this is not a house it’s an outdoor cover. I know, you are asking why this is here. Well, honestly, I couldn’t think of a better place to review it. The reason being that I actually built a small cat house around it from wood. So, it’s essentially an accessory to a cat house; you just have to match the size. This is a warming pad that comes with a free fleece cover and operates with 40Watts. Its size is 12.5″ x 18.5″ which means it will fit into most unheated cat houses. This is well worth the investment. 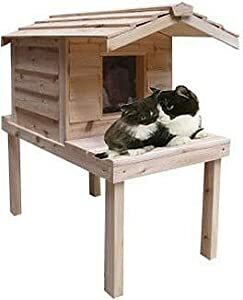 Its time for another K&H Outdoor Kitty House and this one is their extra wide unit. I have to admit; this one does give you great value (size) for money. In fact, if you have more than one pet, then before you decide to buy a standard unit, check out this one first. Bottom Line: For the price you pay and the quality you get, with the extra added bonus of inside space, this is an obvious choice to make. You need this house, believe me, if you have two or more pets, don’t even bother looking at any other models. Its time to close this review with the simplest, most basic house I found on the market. A box of wood, it really doesn’t get simpler than that. You remember the other one I reviewed here? These are handmade, so you get solid, sturdy designs tested and proven. The interior size is 14” x 13,” but this one doesn’t come with a deck, so that’s the size. Bottom Line: This is a Canadian product, handmade and with a price tag that shows this. Each one is crafted with love and care, so you pay for quality. Another good feature is that it comes undecorated, which means you can decorate it, or let one of your kids do that.